Stretching can be defined as “form of physical exercise in which set of muscles are purposely stretched.” stretching is vital and should be done before exercising and after exercising, before exercising it is important as it prepares the muscles for strain during the main exercise schedule and after exercise it relaxes the muscles and prevents strain. Active Stretching – it is a form of stretching in which position is assumed and is held without any assistance using just one’s own muscles. Dynamic Stretching – is form of stretching which involves moving parts of body and then increasing speed and reach, this form of stretching increases flexibility. Ballistic stretching – is a form of stretching which uses body momentum to reach beyond normal range of motion. Relaxed stretching – it is form of stretching in which a position is assumed and then held with using a partner or other part of body. PNF stretching – PNF stands for proprioceptive neuromuscular facilitation; this is a technique of combining active and passive stretching. Static Stretching - is a form of stretching in which an individual reaches the farthest position and holds the stretch at that position. Isometric Stretching – it is a form of stretching which involves the resistance of muscles through tensing of stretched muscles. Helps in tuning mind and body. Brainmeasures is a leading online certification and skill testing company, stretching for fitness certification program is a part of series of Brainmeasures Fitness training certification program. Brainmeasures Stretching for Fitness Certification program is a well structured detailed certification course which will help you learn all aspects of stretching, Stretching for fitness course is all encompassing extensive certification course material on stretching developed by experienced fitness trainers and leading personal trainers under strict ISO controls and will help you learn and master the art of stretching which is essential part of any fitness program and if you desire to become a known fitness trainer you cannot ignore the importance of knowledge of stretching. 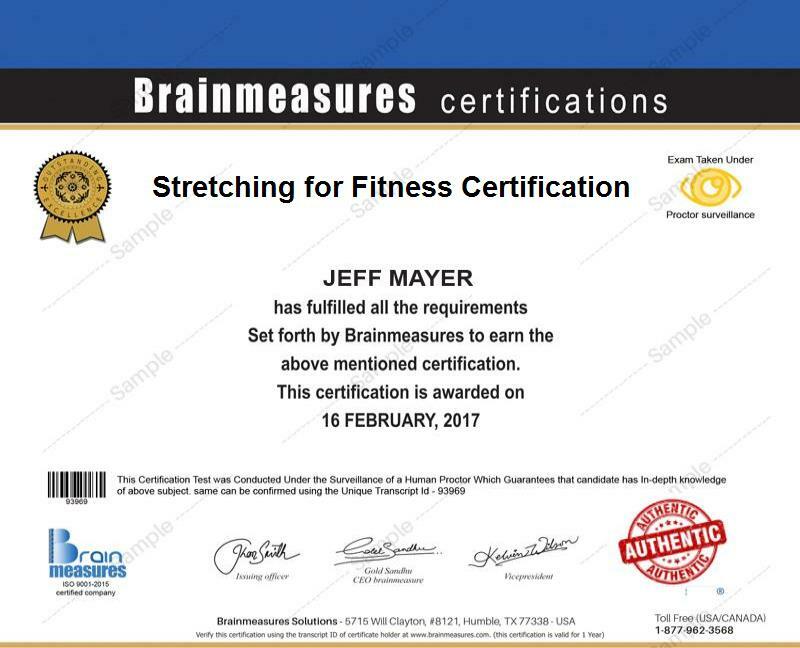 Brainmeasures Stretching for Fitness certification program includes Stretching for Fitness Course, stretching for Fitness certification exam and hard copy certificate. Brainmeasures Stretching for Fitness Certification Course program has been so developed to give an in-depth knowledge of the subject and will help you in mastering the art of stretching, after going through this course you will have complete knowledge of how to execute stretching exercises. You will learn various stretching exercises no matter what your age or lifestyle is. You will learn about various types of stretches such as yoga stretches, sports stretches etc, also stretches for special circumstances such ad pregnancy, back pain, body aches etc. For easy understanding this certification course has been divided into sections and each section tackles different aspects of stretching such as section one deals with basic stretching questions, section two deals with stretches for specific areas such as head, shoulder, knees etc. Section three deals with various stretches to suit your daily needs, section four deals with stretches for various age groups. You will learn science of stretching and know how stretching actually works. Special sections have been devoted to stretching for seniors and children To view detailed syllabus you will have to register with Brainmeasures, just login in your account and check the detailed syllabus of stretching for fitness certification course program. Appropriate use of images, tables and pictures to make the content lucid and interesting to read. In-Detailed course material on stretching developed by experienced professionals. Stretching for Fitness Certification program has been so developed that anyone interested in learning about stretching can enroll in this certification program but this course is essential for fitness trainers, personal trainers, yoga instructors, aerobic teachers, Pilates instructors and anybody related to fitness industry. If you are a personal trainer or fitness instructor then this certification program is indispensible for your career and will put you in better position professionally. Stretching for fitness Certification will be an add on to your personal trainer certification, awareness of stretching benefits is growing and every individual wants that his fitness trainer should be apt in integrating stretching in their daily fitness regime. It is proven fact that certified fitness trainers earn much more than non-certified fitness trainers and if you have this stretching for fitness certification it proves that along with fitness training you have advanced skills and trained in stretching exercises, so you can earn more and your salary can be in tune of $45,000 - $ 60,000., this will increase with your experience.